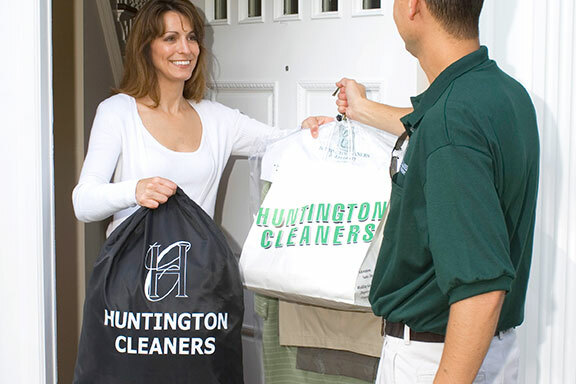 Huntington Cleaners uses the latest drycleaning technology and environmentally friendly cleaning processes. Our skilled cleaning professionals guarantee that you receive premier drycleaning services. Your suits, dresses, coats and sweaters receive the very best care possible. Our dry cleaners and spotters have decades of experience. We clean each garment according to its specified care label, and make certain that items requiring individualized special care and handling receive it. Our shirt laundry detergent delivers the whitest and brightest shirts with no starch build-up .This gives you a better looking and longer lasting shirt. Through our inspection process, we hand finish every shirt as well as replace any damaged or missing buttons. Give us your bed linens, towels, blankets, comforters and bulk laundry, and we will return it clean, fresh and folded. Best of all we save you time and hassle. For added convenience, we offer same day service, Monday through Friday. Drop off your clothes by 10 a.m., and they will be ready for pick up by 5 p.m. that day. Areas of concern on certain garments may delay same day service. Your wedding gown is one of your most precious possessions. It symbolizes an important day in your life and should be treated with special care. Your wedding gown will receive deluxe cleaning, finishing and our special preservation packaging. With proper care, your wedding gown will remain a well-preserved keepsake. Our specialists welcome the opportunity to provide all the care your leather or suede garments deserve. To protect your investment, we take precautions to use special processes that deliver optimum cleaning without shrinkage, loss of color, or fabric distortion. Our alterations department can professionally hem, re-line, replace zippers and repair tears. In fact, we can accommodate almost any alteration request. Let our expert shoe cleaning and polishing service bring your shoes back to life. We can restore your shoes to a “like new” appearance. Huntington Cleaners’ specially-trained team follows a detailed, specific and innovative process to ensure that your draperies are handled with care and attention-to-detail. Our procedures are designed to produce the results you want: clean, fresh window treatments, completed conveniently at your location. Our counter is open Monday through Friday from 7 a.m. to 7 p.m. and on Saturday from 8 a.m. to 5 p.m. For your convenience, we also offer a 24-hour drop box at the front of our store. You're busy and fitting in a stop at the cleaners may not be in your schedule. That's why we arrange our schedule to fit yours. Book using our online scheduling platform, and we’ll come to you to collect your garments for cleaning. We specialize in garment restoration for the insurance industry, and we are a supplier to every major homeowner’s insurance company that has coverage in Michigan and Northern Ohio. We offer on location drapery & blind cleaning. Huntington Cleaners’ specially-trained team follows a detailed, specific and innovative process to ensure that your draperies are handled with care and attention-to-detail. Huntington Cleaners is committed to using gentle soaps and solvents for your clothes. We're proud to invest in processes that reduce our waste and minimize our impact on the Earth.